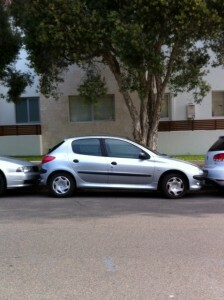 I was across the road, about to drive off, when the driver got into her car, accompanied by a passenger. I called out to her through my car window that it looked unlikely that she’d be able to get out of that spot. She was quite relaxed about the whole thing, and smiling, she said she would just go forward and back inch by inch until she could get out. I didn’t know what she was thinking and was sure one of the cars was going to get hit. Anyway, I drove off to run a quick errand and returned as quickly as I could to re-claim the parking spot that I had just left. I must have been gone for no more than 4 minutes or so. When I returned, I couldn’t believe that the woman’s car had gone. She had somehow managed to get her car out of that spot in less than 5 minutes. Although it seemed like the only plausible explanation was that her car wheels could turn to a 90 degree angle, I don’t think her car had the ability to be driven sideways. Perhaps she was a reincarnation of Harry Houdini! I wished I had stayed to watch her get out of the spot – though watching her might have made her nervous, which may have caused her to hit one of the cars that wedged her in. In any case, she deserves a medal for getting her car out of what was possibly the tightest parked car situation that I’ve ever seen! Hi there bondimermaid. I have currently come across your blogs and find them very interesting, as i am also a resident here. I am currently studying journalism at University of Technology and need to write an amateur story on something news related happening in Bondi. You seem to know a lot. Is there any way of contacting you? I would really appreciate that. Am glad you have found Bondi Banter, since I’m afraid I’m not very active in attracting readers to the site. I will email you in order to make contact.